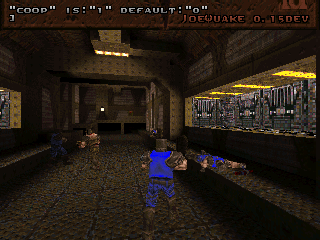 What's up with the software version quake guy being black with the newest JoeQuake? I tried some cooping the other day, and Stubby was all black!! It does the same to myself in chase_active mode: http://mandelmassa.net/temp/blackdude.jpg. Also, why can't we talk to eachother when paused at the very start of a coop demo? That's something we at SDA really miss. Black player problem doesn't happen in coop mode on my machine in the software version with the settings and hardware I use. Just for reference purposes. Yeah, not being able to speak during pause is a tad annoying. Nicely done Jozsef, thanks for that. yeah btw, who havent noticed it I had updated the project page.